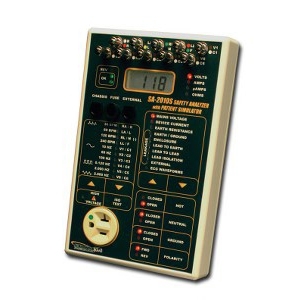 The BC Biomedical Model SA-2010S Series is a microprocessor-based electrical safety analyzer with a built-in patient simulator. It allows for a multitude of tests to be performed on a device using the same unit and lead connections. It provides a full electrical safety analyzer, as well as ECG Simulation with four waveforms with constant QRS duration and six machine performance testing waveforms. There is Patient Lead testing for 10 inputs.